We provide a wide range of PVC shutters that are custom-made to meet your requirements – you won’t have to compromise any of your design ideas or preferences when you come to us. PVC shutters offer an easy to clean, attractive window covering solution that allows you to filter the light in a room exactly how you want to. With our bespoke PVC shutters, you also benefit from extra kerb appeal, as well as protection from excessive noise – as the shutters are made to measure and fitted perfectly, they won’t rattle around and they also insulate the home in terms of both heat and sound. 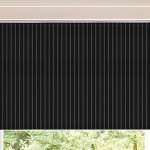 Here at Humberside Blinds, we provide the highest quality plastic shutters to people in Grimsby and Cleethorpes. If you would like to know more about us, please get in touch with us today and we’ll be happy to help.